Join the 2019 Drawdown EcoChallenge! When it comes to stopping climate change, have you ever asked, "What can I do?" We have an answer - the Drawdown EcoChallenge. From Bangalore to Bellevue, people around the world are taking the 21-day challenge to reduce greenhouse gases in our atmosphere. The challenge takes place April 3-24, 2019 and follows actions highlighted in the book, Drawdown. Registration is open now, participation is free and open to the public. Explore the challenges, join an existing team (team DrawdownTO for example! ), create a new one, or join the Community team. Click here for specific Drawdown Toronto instructions. In this course, you will join with others on a journey to radically shift your relationship to global warming: to become better informed, inspired, and empowered into action on the solution(s) you want to focus on. Mondays, April 1, 8, 15, 22 and May 22/29. Details and registration here. 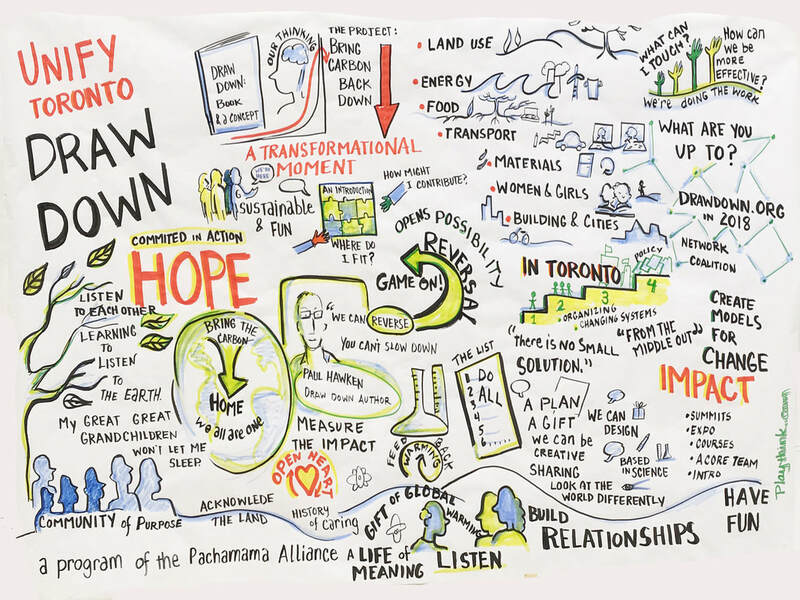 On January 31 2018 we launched Drawdown Toronto with a pilot introduction to Project Drawdown. We held three four-session courses. And our first six of seven Sector Summits (on Food, April 25, Transport, May 16, and Electricity Generation, July 25, Buildings and cities, August 29, Materials, October 24, and Land Use, November 28) were all hits! ​Find out more about the project to actually reverse global warming, based on the latest research from a team of over 100 scientists and thinkers from around the world here, and learn all about Drawdown Toronto's activities here. Paul Hawken circles back 18 months after the launch of Project Drawdown, a living research effort to reduce and sequester carbon as outlined in his book, Drawdown: The Most Comprehensive Plan Ever Proposed to Reverse Global Warming. What has the response to his extensive research been from global activists, political leaders and scientists around the world?How are communities activating around Drawdown, and how can we come together to keep this critical movement spreading and accelerating? As a living research effort, Project Drawdown works with an international team of students and scientists to map, measure and model the one hundred most substantive solutions that can reverse global warming by reducing and sequestering greenhouse gases. In this video, we learn how communities are activating around this template of possibility, as outlined in Hawken’s book, which was the bestselling environmental book of 2017. "Solving Climate Change: A Blueprint"
Most people agree that climate change is a problem. But what can be done? Katharine Wilkinson endeavors to answer that question in her book, "Drawdown: The Most Comprehensive Plan Ever Proposed to Reverse Global Warming." The Agenda welcomes Wilkinson to discuss her ideas. 18:02. Aired April 23 2018. Click here to view the video. Through monthly dialogues and other events, we are bringing Toronto change agents together--leaders and interested citizens from social justice movements (e.g. Occupy), ecology, democracy and social justice activists, and faith-based communities. We are offering spaces and processes that help people transform despair and apathy in the face of overwhelming planetary crises, into collaborative action toward a life-sustaining society. We bring a broader context for social change work, a new way of seeing the world--as our larger living body--that helps free us of the assumptions and attitudes that threaten the continuity of life on Earth. We are working to build motivation, creativity and solidarity for the Great Turning to a sustainable, just and thriving human presence on the planet. and we are determined to catalyze a shift toward a new direction by acting locally, in our own homes, in our communities, and in our city: Toronto. and we are ready to connect a full range of diverse committed people and organizations in Toronto to facilitate the emergence of a just, thriving, sustainable way of life for all. We draw inspiration and courage, and welcome engagement from change-making individuals, organizations and communities in Toronto and around the world…and we focus our energies on where we live. Paul Hawken, in his speech at the 2006 Bioneers conference, describes the world's largest movement. "From billion-dollar nonprofits to single-person dot.causes, groups and organizations dedicated to restoring the environment and fostering social justice collectively comprise the largest movement on earth. This movement has no name, leader, or location, and has gone largely ignored by politicians and the media. Like nature itself, it is organizing from the bottom up, in every city, town, and culture, and is emerging to be an extraordinary and creative expression of people's needs worldwide." It springs from "humanity's collective genius" and is dedicated to reimagining our relationship to ourselves, one another, and nature. To follow the evolution of the "Indigenize or Die" series (January 2016-November 2017), see Friends of the 7th Generation: Allies Standing Up for an Indigenous Future. In this two-year series, "Indigenize or Die," we deconstructed the myths of the dominant culture, explored a more truthful historical perspective and how that manifests today. Then, through the lens of decolonization and re-indigenization, we explored together possibilities for an ecologically sustainable and socially-just way forward. We asked, how can we ensure the survival of complex life on this land in accordance with its legitimate laws and the laws of Nature? The intent of the series was to weave an understanding of history and current reality into developing a practical "go forward" plan for this land. What emerged was the Seventh Generation Initiative, a grass-roots phenomenon led by Indigenous women and youth, based on our love for the the land, the water and the future generations of all species. Guided by a series of four fires led by Mississauga ceremonial keeper, Nancy Rowe, the Initiative is rapidly emerging throughout the Great Lakes region. To stay abreast of developments and participate in their unfolding, go to Friends of the 7th Generation (friendsof7th.org).